The purpose of the Queensland Government ICT Workforce Planning Methodology is to enable agencies to achieve sustained organisation performance and accountability, through the development of a capable ICT workforce. By using the methodology managers will be provided with a framework for making informed staffing decisions in line with an organisation's mission, strategic plan and budgetary resources. 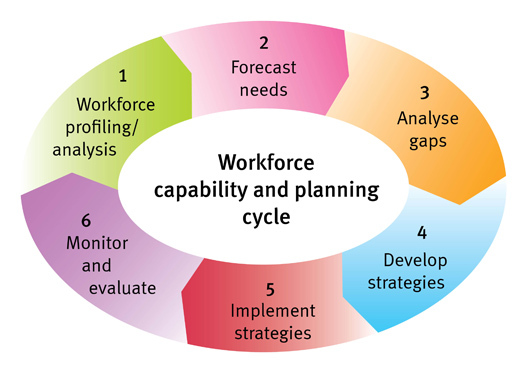 The workforce capability and planning cycle identifies six components that need to be considered when implementing workforce planning. These elements are broken down to better help agencies work through their planning process.